It’s Friday! I get to pick out the stuff that popped me in the face today. I’m not sure how to rodeo tie so many blogs, so I think I’m gonna stick with one of the basics, something we can all understand–geometry. 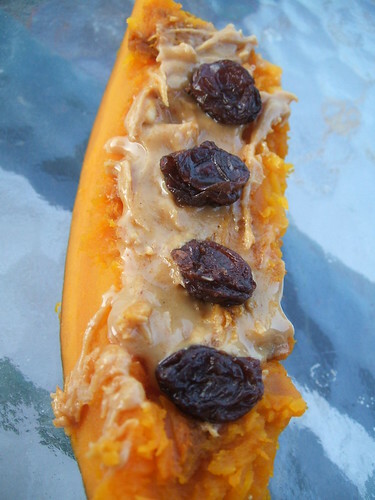 First off, has anyone checked out Rayray’s rectangular ants on a log with kabocha squash? Celery has never been my favorite part about these standards, I think using steamed squash as the peanut butter carrier is pure genius. This post really hurt my head when I saw it, so smart. Urban Girl Scout’s round Oatgurt, y’heard. Seriously, I bet you’ve never had anything like this before, she also gets extra kittee points for making it herself and for having the foresight to pre-soak. I applaud you lady. 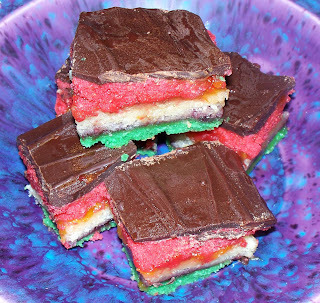 Home Sweet Vegan Home‘s wildly and wonderful super vibrant square rainbow cookies. You can’t post something like this without the recipe, it breaks hearts. Vegan Victuals deconstructs Daiya cheese, which is sorta the opposite of geometry, so I’m including it. Sweet cassava– first bubble tea balls and now this. Who’s a great little tuber boober? That’s right, you are little cassava root! Circle shaped homemade corn crusted empanada pizza layered with thick slices of potato by Bicycle Bread. Why is there no one in my life to fill this void? I have needs. I want to eat circles. Cafe Karma shoves the Food Network into the Veganizer (c) and comes out with triangular slices of baked Angelhair pasta pie. No Giada di Laurentiises were harmed in the making of this blog post. I do realize that I used a round food thing and a circular food thing. In geometry, round and circular could mean two different things, at least in this case they do. Besides I looked at several hundred posts searching for an ellipse, and could not locate one. Stretch that round oatgurt out, and the need is met. I’ve gotten a few emails from folks who want to know how they can maximize the Vegan MoFo. I’ve also heard from several people who are going vegan for the first time this month, and from others who have never blogged before. If you’re seasoned and zesty with the MoFo, why not adopt a blog or blogger or ten and give ’em your full support. It can be as easy and quick as a single comment on their blog everyday. Find some newbsterites and comment bomb! MoFo Maintenance Update: please make sure to check that your blog’s feed is working on the MoFo RSS feed that’s been setup on Bloglines and that you are linked to the master list if you are MoFoing (so folks can find you easily). Also, if you don’t like Bloglines, you can export the list into another reader, just scroll to the bottom and clink on the “export” link. Since I was long ago outnumbered by your masses, I trust if you have a problem you’ll send me an email. Thanks beanie weanie mofu patooties. After reading all these posts, I wish I had one of Your Vegan Mom’s Cranberry Margaritas! Hey Kittee, great round up. A few of us have found that the Bloglines Export Link just opens up a new browser window with a page of text, we’re not sure how to get that into Google Reader unless we add the 300+ blogs one by one! Do what Isa says, I was just able to import them into google reader in like two minutes. Twas easy. Great roundup and thanks for the bloglines page. I am already excited that there are so many new blogs to look at! Try to save the page of text as a .opml file, then import it to google reader and see if that works. Mandee – that new browser window has also been saved to your computer (usually in your temp folder but not always.) You can select where it is saved in the “you have chosen to open” window. All you do then is go to your preferred reader and somewhere you will see an option to “Import”. Locate the export.opml file and there you have it. MERRRRR! Didn’t see Isa’s reply! Thanks so much for the roundup! You are stellar! 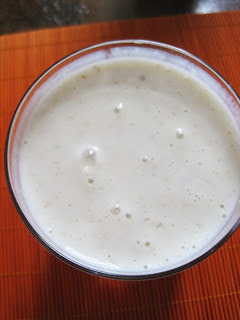 Yes, thank you for the round up and the post about xanthan gum….The jury is still out for me but I totally get the slicky thing you are talking about….I only use a tad in my gluten free cookies…I suppose I could use an alternative especially when you read this from wiki… In the oil industry, xanthan gum is used in large quantities, usually to thicken drilling mud. ewwww. Great round up…so many new blogs to check out! Yay mofo! It all looks so good. Very inspiring.